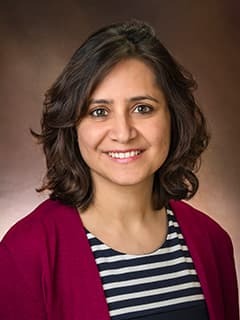 Shelly Soni, MD, is an attending high-risk obstetrician in the Center for Fetal Diagnosis and Treatment at Children's Hospital of Philadelphia. Soni S, Gupta A, Jacobs AJ. Exclusive breastfeeding rates in a multiethnic population at a community hospital. J Reprod Med. 2011 May; 56(5-6): 195-198. Cited in PubMed; PMID: 21682113. Soni S, Badawy SZ. Celiac disease and its effect on human reproduction: a review. J Reprod Med. 2010 Jan; 55(1-2): 3-8. Cited in PubMed; PMID: 20337200. Soni S, Aggarwal N, Dhaliwal L, Wangkheimayum S, Menon MC. Absent Circadian Rhythm of Proteinuria in Hospitalized Patients with Preeclampsia. Hypertens Pregnancy. 2010 Sep; Epub(Epub): 1-7. Cited in PubMed; PMID: 20860489. Soni S, Aggarwal N, Dhaliwal L, Wangkheimayum S. Correlation of 2-hour and 4-hour urinary proteins with 24-hours proteinuria in hospitalized patients with preeclampsia. Hypertens Pregnancy. 2009 Feb; 28(1): 109-118. Cited in PubMed; PMID: 19165675. Aggarwal N, Suri V, Soni S, Chopra V, Kohli HS. A prospective comparison of random urine protein-creatinine ratio vs 24-hour urine protein in women with preeclampsia. Medscape J Med. 2008 Apr; 10(4):98. Cited in PubMed; PMID: 18504482. Aggarwal N, Soni S. (May-June 2007). Management of Shock. Journal of Postgraduate Medical Education, Training& Research National Board of Examinations.Vol II, Chapter no. 10, Page no. 44-46. Soni S, Krantz DA, Greenberg M, Vohra N, Rochelson B. Recurrence of extreme serum analytes in subsequent pregnancies and their association with obstetrical outcomes. Poster presented at: 64th Society for Reproductive Investigation Annual Scientific Meeting; Orlando, Florida. 2017. Treece A, Reichert S, McKay E, Soni S, Khalek N. Prenatal Diagnosis of Beckwith-Wiedemann Syndrome: Clinical Characteristics and Correlation with Placental Pathology. Poster presented at Society for Pediatric Pathology, Spring Meeting, Boston, MA. March 2015.